The use of portages, trails, and temporary camps provided an alternate route during stormy seas and inclement weather. Overland baidarka portages served as a back door to hunting and trade corridors on the peninsula. As noted in Chapter 1, a series of trails linked the coastal and inland regions of the Kenai Peninsula. Routes linked Prince William Sound and the head of Resurrection Bay with Turnagain Arm. These routes provided year round access to the coast, especially for the Dena'ina who were less adept at navigating in the open waters of the Pacific Ocean. In general, the Pacific Eskimo identified with individual villages and village groups, rather than one large collective. Oswalt described village makeup and membership as "fluid" with subtribes having affiliation with one or more villages. Archeological investigations in the 1930s by de Laguna and Birket-Smith in Prince William Sound detected small populations and scattered village sites despite an apparently rich resource base. Oswalt attributed sparse village distribution of the Unegkurmiut to a relatively unproductive environment despite the region's resource potential. As noted in "The Fight with the Dena'ina", Chugach raiding parties from Prince William Sound ranged in size from twelve to twenty-eight men per village. Others including Dall maintained that the fishing was sparse, especially in the lands closer to Prince William Sound. Hunting was the main source of food for the Chugach villages. The Unegkurmiut established village sites on the shores of bays with close access to bodies of water including lagoons, streams, or bays. Given an alternative, land travel was minimal. Sea routes provided easier access to coastal villages. Villages located on elevated shorelines provided commanding unobstructed views and a ready escape route by sea in the event of attack. Higher observation points were used to spot the approach of game and unwelcome strangers. de Laguna contended that the need a for strategic village location outweighed other geographic factors including proximity to salmon streams and shellfish beds typically found at the headwaters of bays. For these reasons as well, the Chugach tended to place villages near the entrances to bays, rivers, and recessed fjords. 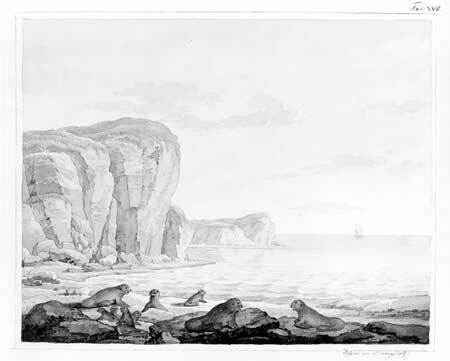 View of rocky beach with family of sea otters, from Georg Langsdorff, c. 1805. Bancroft Library. Other features, notably Sitka spruce trees marked and scarred by the harvesting of slabs of bark, constitute another indicator of cultural land use. Known as culturally modified trees, these trees bear the mark of where Chugach stripped and carved out patches of bark, both as a food source and as building and artisan material. 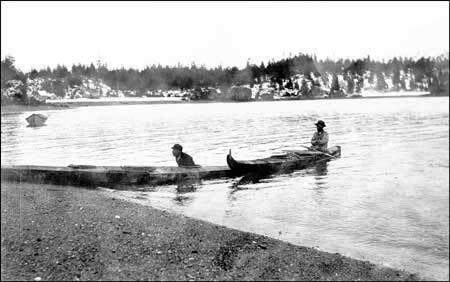 Native paddlers rest in their baidarkas near Seldovia, c. 1916. Anchorage Museum of History and Art, photo B91-9-143.